Over/Under: Under 154.0 at 1.90 Bet Now! With the series tied at 1-1 as we move into Game 3, we should be in for a fantastic evening of basketball action in Turkey on Wednesday night. The opening two games in Greece were very different, which makes it harder to predict but you know for sure that this is going to be a physical clash with a very noisy and passionate crowd roaring the hosts on. When it comes to exciting Euroleague Playoff action, this is likely to be one of the biggest ties of the week. While the defeat at home was a big issue for the Greek side to deal with, there is also the fact that Nikola Milutinov limped out of the game late on and he has to be classed as a doubt heading into this third game. This is one area where the quick turnaround between intense games doesn’t always help because players often need more time to bounce back from injury. Tyler Honeycutt has played a key role in the two games so far, offering 32 points and 19 rebounds in the two games of the series so far. Honeycutt is likely to line up against Georgios Printezis, who remains a key player for Olympiacos. At this stage of the season, individual battles can decide games and the way these two players engage is likely to be a big factor of the game. 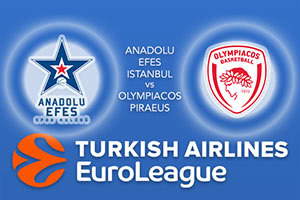 The bookies think this is going to be a tight game so back Anadolu Efes Istanbul at -2.5 at odds of 1.90. If you’re looking for the Over/Under market for this Euroleague Playoff game, go UNDER 154.0 which you can find at odds of 1.90. Bet Now!